Should seniors be exempt from passport rules? Maybe it’s all this cold weather, maybe I’m still mad about the AFC Championship Game, or maybe it’s just that I’m a cranky New Englander with a heart of coal—but come on, people, quit your whining about the new passport rules. OK, some background. Effective earlier this year, all travelers coming into the U.S. by air (and, soon, by land or sea as well) are required to hold a valid passport. 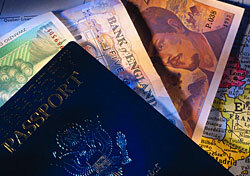 A passport costs less than $100 and is valid for 10 years. What’s the problem? There are quite a few problems, apparently. First comes word that the Department of Homeland Security (DHS) is considering a move to exempt U.S. and Canadian children under 15 from the land and sea portions of the law. But here’s where I draw the line: Now a group representing senior citizens says seniors should be exempt from the passport rule as well because it places a “significant expense” on them. Why don’t we exempt all low-income adults, then? How about non-English speakers who have trouble reading the application? Or any other group for whom the passport rule creates an “undue hardship.” Heck, my passport expires next year—so please, exempt me, too. I’m too busy to renew it. At some point a law just needs to be a law. It’s there for a reason. If the cost of a passport really means the difference between that trip to Cabo or staying home, well, maybe you should be saving up anyway. Insensitive? Sure. Blame it on the undue hardship of having to keep tabs on this whole passport fiasco for the better part of a year. Passports. You want to travel abroad, you need one. The rest of the world understands this. What’s the big deal?